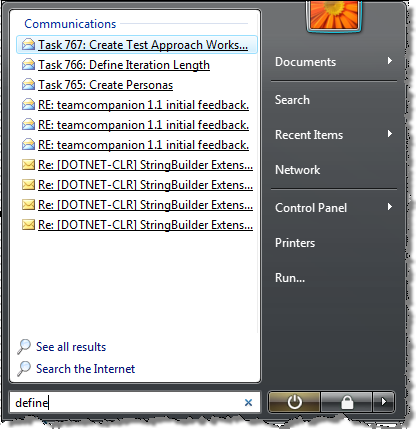 TeamCompanion integrates work item management with Outlook. As a part of this integration, every time a work item query is executed we save the complete content of all work items from the query result (of course we get only the new information or info that was changed since the last get). We do that in order to be able to support offline work, to offer work item information even if TeamCompanion is not connected to the TFS server. 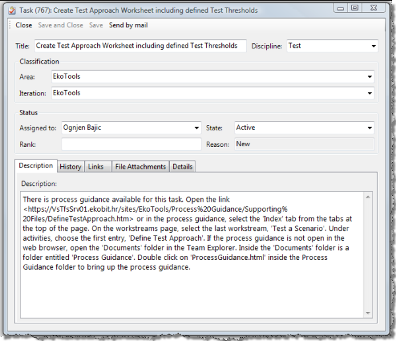 At the same time, since this data is subject to Outlook indexing engine, the full text search of work items is supported. 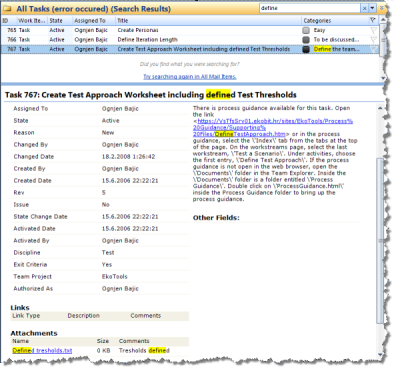 All work item fields, standard or custom, are subject to search. Search also includes some not so obvious parts of work item information: attachment names, links and even categories if you assign them to the work items (btw. categories are especially useful during the triage!). Outlook highlights all occurrences of the searched term. The only prerequisites are that you have retrieved the work item data by executing a query from TeamCompanion and that the indexing engine has already processed the query result (count with some delay). For performance reasons we (currently) don’t support the search through the work item history. We might consider it for some future version. This kind of search works wherever desktop search works -Windows XP and Vista. But, there is more to it. Since the same index is used by the Windows Vista instant search, we are able to support searching for work items from the Vista Start menu “Start search” edit box. You enter the search term, get the list of results, choose one and as long as it is a work item, you will get it opened in the nice familiar work item edit form! Usualy you will need to help search engine to find precisely what you want.More about that in following blog enties. That’s the beauty of joined powers of TeamCompanion, Outlook and Vista. 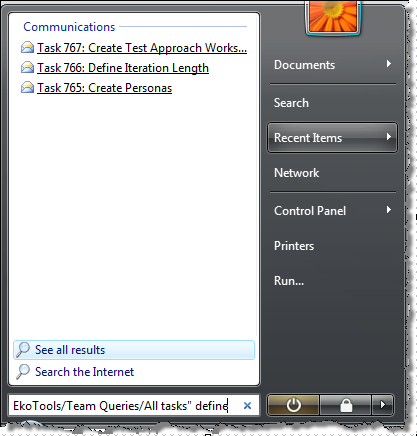 Team System Web Access Power Tool Released!